We're moving right along in my email series on how to rank in Google using the most recent proven techniques. Much has changed in the way Google scores your site for ranking purposes, so it's important that you stay up to date. This lesson will cover the third most important factor. Page-Level Keyword and Content-Based Features basically covers how well optimized everything is that's visible on the page you're trying to rank: the title, the headings, the page body, the images, etc. According to the 150 experts surveyed, proper content optimization scores a 7.8 out of 10 on the scale of importance for ranking in Google. Make sure that your primary keywords appear at the beginning of the title, meta description and page headline. The primary keywords should also appear in the page body two or more times (but not too much) along with other related keywords for the page topic. Secondary keywords should appear in the title/body/subheadings if appropriate. Having proper descriptive ALT tags on your images also matters. Some highlighting of important keyword phrases using bold and italics is a good idea as well. Use a top-down, broad-to-narrow structure with subheadings. In the previous lesson I used an illustration about what makes a person's face beautiful. It's not just one element of the face, it's many elements combined. The same thing is true of the content of your page. There are many elements that will improve Google's scoring of how relevant your content is to the keywords being searched by the user. In the past, having a lot of high quality links to your page was enough to get you ranked. High quality links are still very important to ranking in Google, but they are not the only factor required. In the past it was possible to rank a page whose content was very poor (and sometimes almost non-existent) based solely on the quality, quantity and anchor text of the links. Those days are gone. If you're still day-dreaming about that era, wake up and smell the double tall breve latte with a dash of cinnamon. Just like modern-day coffee drinkers have gotten more sophisticated and demanding in their tastes, so too Google is requiring more from you if you want to feed its addiction for quality content. So what is Google looking for when it crawls the pages of your website? Before we get into the details of these things, let's talk a bit about Google versus human beings. You're a human being (I trust). You can read an article and immediately know what it's all about. You can pick out the subtopics and concepts, people and places involved just by reading it. And when you're done you can write a brief summary of what you just read and email a recommendation (or not) to a friend. The article doesn't have to be formatted in any special way for you to do this. Your brain is a marvel of software engineering in that respect. Google, however, is a machine. While pretty darn good at what it does (for a machine), it cannot "understand" what it reads in the way you do. It doesn't instinctively know what an article is about or if it constitutes high quality. It can only guess at this by using signals that it's been designed to look for. Your job as a website owner is to add those signals to your content to help Google understand what it's about and interpret it as high quality. Your goal should not be to trick Google into this, but to try and help Google come to this conclusion. I like to call the result of this process structured quality. None of the suggestions below should be taken if doing so will hurt the human estimation of its quality. A human being can easily see if your content is good or not. You want to take that same high quality content that humans would love and tweak it in ways that help Google come to that same conclusion. In short, do not sacrifice quality to achieve technical perfection. It does you no good to get a page to rank in Google if the people who arrive on the page don't want to stay there! Just like a face does not require every facet to be perfect in order to be seen as "beautiful", the pages of your website do not have to follow every single process below exactly to do well in Google. The list below is a checklist of guidelines, not absolute musts. While most of the suggestions can and should be implemented most of the time, all of the suggestions do not have to be implemented all of the time. Got it? Okay then, let's dig into each one of these a little more. Google wants to see pages that are topical -- not driven solely by keywords -- and that topic should be sufficiently narrow. For example, your website may cover a variety of different kinds of insurance, but your site should be broken up into sub-sections for each kind of insurance (life, auto, health, etc.). Each page in the sub-sections should cover a specific narrow topic ("Should college students have life insurance? ", "Lowering auto-insurance premiums with a bad driving record", etc.) The idea here is to keep it fairly narrow. You don't want to try to cover a huge, broad area of your site topic in one article. Overview articles are important and have their place, but most of the sub-section articles should focus on a specific, narrow topic. And when you do write long overview articles, it's a good idea to break up each section into another page. So, for instance, the first page may cover why life insurance is important, the second page may cover the ins and outs of term life insurance, the third may cover whole life, etc. This one is simple. If you're targeting the keywords "Life insurance for college students", that should be at the beginning of your page title (e.g. "Life insurance for college students - why it's important.") And keep your page title under 75 characters. For very long-tail keywords (keyword phrases with 5 or more words) this may not be practical, but for shorter keyword phrases it's a good idea. Virtually no topic worthy of a full page article has zero subtopics that need to be discussed. So break up your article into subtopics. "Life insurance for college students" can be broken up into, for example: Why college students need life insurance, When should a student get insurance, How much life insurance should you get?, etc. Without over-doing it, use keywords that are related to your primary topic in the subtopic headings. Your primary keywords/topic should be sufficiently narrow, but your subtopics should really dig into the details. This is where keyword research becomes important (more on that in the next section). Another simple one. Just make sure that the primary headline on your page contains your primary keywords. And make sure that the headline is visible "above the fold". That is, it should be seen by the visitor as soon as the page loads -- they shouldn't have to scroll down to see it. Do not overdo this! But when it makes sense, bold or italicize your keywords (either primary or secondary). In addition to the page title and headline, your keywords should be in the body of the page at least twice -- but not too many times. Your use of the keywords should sound natural when you read it out loud. If it sounds excessive out loud, it is. 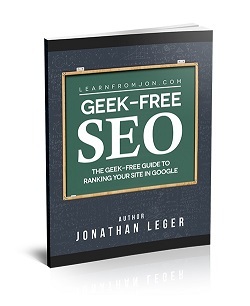 Google will break the page down into all of the keywords and phrases that appear on the page. Any keyword or phrase that only appears once won't be seen as any more important than any other phrase. You don't want that. You want Google to realize that your primary keywords are important. But you don't want to look like you're stuffing your keywords in the page either. Remember, make it sound natural when it's read out loud. As I mentioned before, no topic is made up of just one single set of keywords. There are other, related keywords that would naturally appear in the topic. For instance, your primary keywords may be "life insurance for college students", but within that topic you will likely also talk about "term life insurance for college students" or "whole life college policies", etc. Those are "long-tail" keywords. By themselves they don't get searched for much in Google, but that also means that their competition is generally much lower. Having multiple long-tails in your page makes it less keyword-driven and more topical (a plus in Google's estimation) and also gives your page a chance to rank for multiple keywords. And let me tell you, those small search numbers for long-tails can really add up. Just be sure to always read the content out loud to make sure it flows well and sounds natural. If it sounds like you're trying too hard to push keywords into your article, you can bet that Google's going to see it that way too. Read it out loud. Read it out loud... read it out loud for cryin' out loud! This one is easy to overlook because you can't see the ALT tags of your images when you're looking at the page (not unless you hover your mouse over them). It's important that you add the ALT tag, though, because it helps add to the overall relevancy of the page. Most site building software will let you right-click an image and set the value of the ALT tag. It's often better to see how things work than to just read about it, so I went ahead and dissected a top-ranking page in Google so you can see how it incorporates many of the suggestions listed above. It's important to note that the page has most, but not all of the components that help Google determine a page's topic and quality. Remember, beauty is the combination of many facets, not necessarily all of them. When you sit down to create an article for your site, you usually have the primary keywords in mind already. Once you do, the next step is to take that topic and break it into smaller subtopics that you can create subheadings for, and to find related secondary keywords that you can use in the articles as well. I love Keyword Canine 3.0 for this, because it has a tool (the Keyword Explorer) that will show you all of the keywords Google feels are related to your topic -- and how difficult they are to rank for. There's not much sense in trying to target one page for a variety of very difficult keywords. You want to find related keywords that are easier to rank for, which improves your chances of catching those extra visitors in addition to the ones hitting your page for your primary keywords. For example, let's say that I wanted to write an article on how to train a dog using a clicker device. 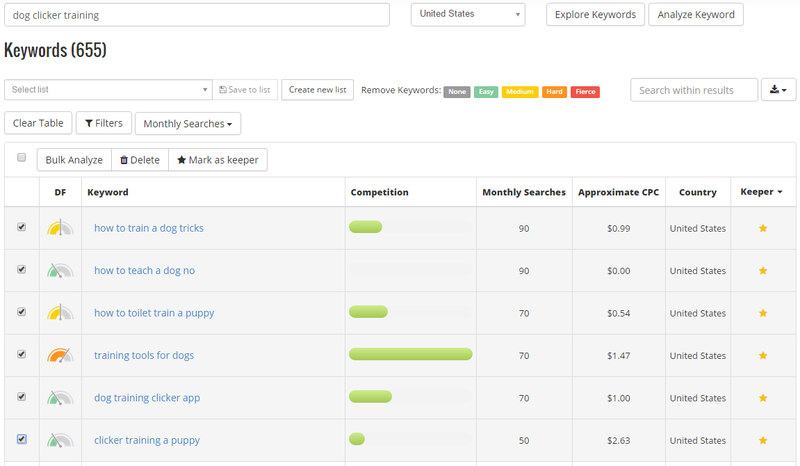 In KC3 I simply entered the primary keywords "dog clicker training" in the Keyword Explorer and clicked Explore Keywords. I then filtered the results to only show keywords with less than 100 monthly searches and at least 4 words in the keyword phrases. That gives me the low-competition, long-tail keywords that I can work into my article as subheadings and secondary keywords. There's some great stuff there! You can imagine subheadings in the dog clicker-training article like: "How To Teach A Dog 'No'", "How To Clicker-Train A Dog To Do Tricks", "Clicker-Training Puppies", "Apps To Help You With Clicker Training", etc. That's why a great tool like KC3 is invaluable when planning the content for your site. You no doubt already know the primary topic you want to write about (but if you don't, KC3 can help you with that too). But it's easy to overlook the many, many secondary keywords that you can work into the great topical articles that Google loves to see. Google isn't ranking sites based only on their link popularity anymore. Links are still very important, but other factors are also very important. Remember that the SiteLinks and PageLinks were rated an 8 out of 10 by 150 experts, but the importance of page-level content was rated a 7.8 out of 10 -- not far behind. Create topical content for your pages and not content that targets a single keyword. Make sure you're using related subheadings and secondary keywords. A top-down, structured approach that goes from the broader topic into more narrow subtopics works best and makes it easy for Google to figure out the path your content is following. The next lesson will discuss more page-level features that are unrelated to the topic or keywords of the content. Copyright © 2015 Learn From Jon. All Rights Reserved.